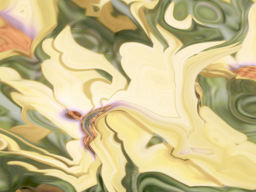 This is a GLSL shader that is a "texture warp/distortion" effect. It uses the Ashima Noise implementation that's been kicking around lately, that I particularly like and think looks nice and organic. I'd used it for generating patterns, but had the idea a month or so ago to use the noise to perturb in input texture - which didn't occur to me at first since the whole deal was that it's a "textureless" noise implementation, but I'm glad it did! Go through the "Mode" values to checkout the various basic looks, 4 Modes in all. "Amount" will increase the amount of the rippling, while "noiseFreq" will tend to increase the density of rippling per area. "Speed" controls the pace of distortion fluctuation. "Bump" will do some stuff to the .z channel to mess with the lighting a bit in modes where it's active. "Spot R1/R2" control the throw of the mouse active light. "gammaOn/gamma" controls gamma (psonice's gamma code...if it works, why not use it?). Then there's some color channel offset stuff. I'm very new to working with QC but very interested in playing around with this composition, however when I open it, the viewer is entirely black. I get no null warning when opening the file, and quartz runs fine with the file open. Am I making some amateur mistake? I can see that my video input is correctly going into the macro, but is exiting as an entirely black screen. Hey there; you may want to check the settings panel on the "render in image" patch. I probably manually set it to 32 bit. Just this week when deploying some recent code on a few different makes (new intels and ati machines), I realized that this causes some computers to output black. On the computer I wrote it on, it just gave a bit more precision. Anyway, I believe this was one of them, as well as some other reaction diffusion and feedback loop based compositions. The Render in Image patch was not manually set to 32 bit. See what happens if blend mode is changed from over to replace on the glsl grid inside the glsl patch maybe ( or vice versa )? Replace to Over on the GLSL Grid- and I'm getting a black unfathomable space at present [me too •~] - wondering at what exactly has changed driver wise over the past few months [I didn't notice much else change elsewhere in any other graphics work]. I can't see this either on my 2011 MBP (OS X 10.7.4). I tried using different blend modes. Looks really interesting… nice Pro-grade resolution of detail. Nice patch George!! I had the same problem with the black screen. I notiched that when i turn on the "disable color correction" in the video in patch it started working again. Im on 10.8 by the way. Note to oneself - must make a note about this in the composition. Now I know what 'changed' over the past 6 months. A simple setting that I'd tweaked awry.